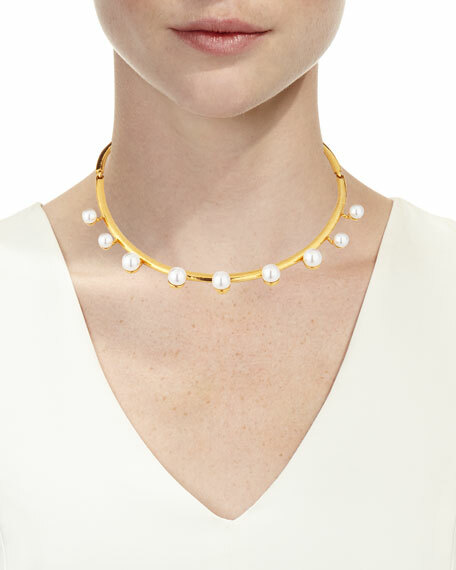 Oscar de la Renta pearly floating necklace. Brunello Cucinelli blouse in pinstriped chambray. Wing collar with contrast satin stripe and monili beading. Button front. Long sleeves. Chest patch pocket. Vented high-low hem. Cotton. Made in Italy. Model's measurements: Height 5'10"/177cm, bust 31"/79cm, waist 24"/61cm, hips 34"/86cm, dress size US 0/2. 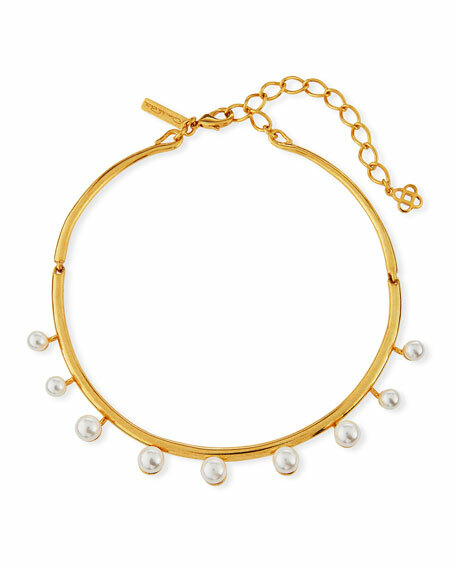 EXCLUSIVELY AT NEIMAN MARCUS Fallon choker necklace. Slim black leather cord. Polished imitation rhodium-plated brass hardware. Prong-set baguette and round cubic zirconia crystals. Self-tie wraparound style. EXCLUSIVELY AT NEIMAN MARCUS Hipchik "Leighan" beaded necklace. Mixed beads, including turquoise, wood chips, pyrite, and rhinestones. Brown suede tassel pendant. Approx. 4" pendant drop. Lulu Frost Plaza number pendant necklace in golden brass. Letter pendant features a style that references the historical significance of an iconic NYC landmark. Vintage-inspired brass chain. 2.5" x 1.25" pendant. 34"L chain. Lobster clasp. Made in the USA.